The Stifel Theatre (originally known as the Municipal Opera House and later known as Kiel Opera House) is a civic performing arts building located in St. Louis, Missouri. 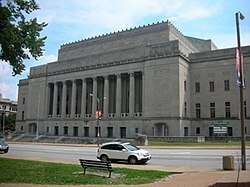 Founded as the "Kiel Opera House" (in honor of former St. Louis Mayor Henry Kiel), it opened in 1934 as a part of the "Municipal Auditorium and Opera House". The theatre was in operation until 1991. The adjacent Kiel Auditorium was closed and demolished, later becoming the Kiel Center. When the auditorium was slated for demolition, the owners of the complex promised to rehabilitate the opera house as well. The owners, however, never renovated the building, instead claiming that they had fulfilled their financial obligations. In June 2009, the St. Louis Board of Aldermen voted 25–1 to subsidize the renovation and reopening of the theatre under the direction of its new owners, Sports Capital Partners. The subsidies were funded by municipal bonds and state/federal historic tax credits. On July 12, 2010, it was announced that the name was changing to the "Peabody Opera House", named after the company Peabody Energy. The renovation lasted for fourteen months and included the construction of a new entrance for the building. On October 1, 2011, the Peabody Opera House opened for the first time since the $79 million renovation. The show featured personalities such as Jay Leno, Aretha Franklin, and Chuck Berry and was attended by a full house of 3,100. On July 16, 2018, it was announced that the building had entered into a 10-year naming rights agreement with Stifel Financial Corp. and would be renamed Stifel Theatre. On June 20, 1965, Frank Sinatra, Dean Martin, and Sammy Davis Jr. with Johnny Carson as the emcee (subbing for Joey Bishop who was out with a bad back) performed their only televised concert together during the heyday of the Rat Pack. A closed-circuit broadcast done as a fundraiser for Dismas House (the first halfway house for ex-convicts). After being thought lost for thirty years, Paul Brownstein tracked down a print of the show that had been sitting in a closet in St. Louis. It has since been broadcast on Nick at Nite (in 1998) as part The Museum of Television & Radio Showcase series and released on DVD as part of the "Ultimate Rat Pack Collection: Live & Swingin'". On July 11, 1978, The Rolling Stones performed one sold-out show at the theatre. Bill Graham was the tour promoter. The Stones used a stripped back, minimal stage presentation compared to previous tours with an emphasis solely on music and attitude rather than presenting a grandiose extravaganza. Because of the limited seating at such an excellent venue, fans who were unable to purchase tickets gathered outside the building before showtime in protest. A police force with dogs was needed to keep the peace. ^ ".0Kiel Opera House". Ecology of Absence. August 25, 2006. Archived from the original on February 17, 2006. Retrieved October 2, 2011. ^ "History". Official Website of the Peabody Opera House. March 2013. Archived from the original on March 12, 2013. Retrieved January 25, 2014. ^ "Crumbling Landmarks: The Kiel Opera House". Built St. Louis. January 15, 2007. Retrieved October 2, 2011. ^ Logan, Tim (June 6, 2009). "Kiel Opera House plan wins final city approval" (PDF). St. Louis Post-Dispatch. Lee Enterprises. Archived from the original (PDF) on April 26, 2012. Retrieved December 28, 2011 – via SCP Worldwide. ^ Garrison, Chad (June 5, 2009). "Board of Aldermen Approve Subsidy for Kiel Opera House". Riverfront Times. Euclid Media Group. Archived from the original on June 8, 2009. Retrieved October 2, 2011. ^ Duggan, Eileen P. (September 3, 2011). "New Life For St. Louis Landmark". Webster-Kirkwood Times. Archived from the original on March 11, 2019. Retrieved October 2, 2011. ^ Lippmann, Rachel (September 30, 2011). "After 20 silent years, life returns to the Peabody Opera House". KWMU. University of Missouri–St. Louis. Archived from the original on October 21, 2011. Retrieved October 2, 2011. ^ Johnson, Kevin C. (September 19, 2011). "Peabody premiere lives up to its billing". St. Louis Post-Dispatch. Lee Enterprises. Retrieved October 2, 2011. ^ Held, Kevin S. (July 16, 2018). "Peabody Opera House gets new name – Stifel Theatre". KTVI. Tribune Broadcasting. Retrieved March 12, 2019. This page was last edited on 13 March 2019, at 01:51 (UTC).